Star Wars: The Last Jedi is quickly upon us as the marketing is starting to heat up. Force Friday is just around the corner and we’ve received a couple of glimpses of the toys we can expect to hit the shelves this Christmas! We should expect the next trailer to break the internet in the next couple of weeks but in the meantime there’s news that has just hit the web! So far, we’ve had our first look at Kylo Ren’s new toy and now we have even more news regarding the newer vehicles and ships we will be witness in the upcoming film.Thanks to The Star Wars Show Youtube channel, we have our first official look at two of the upcoming First Order vehicles. One of them is a new prototype of an AT-AT walker and another is a new class of Star Destroyers. Check out the video below to get the exclusive scoop on these brand new vehicles! The AT-M6 is the new class of walkers for the First Order and boy do these things look deadly. It stands for “All Terrain Megacaliber Six” and will look to inflict massive damage against the Resistance. The “Megacaliber Six” name is derived from the large canon that sits right above the head. Unlike the former AT-ACT and the AT-AT that get their features from a camel, this walker however has a more ape-like approach to it. It still stands on all fours, but the main function is the difference in posture. It’s constructed to be able stand its ground when firing the megacaliber six canon. Its legs will help stabilize it while it fires at oncoming Resistance artillery. If there’s one thing the Empire has done right over the years, it was improving their weaponry to their advantage. Originally the Empire, the #FirstOrder have clearly done their homework when it came to large-scale battles against either the Rebellion or the Resistance. In #RogueOne, the Rebellion made it look easy to take out the AT-ACT’s. Their armor wasn’t as strong as it could have been and the Empire clearly underestimated their attack. After all, this particular walker wasn’t built for combat. It was merely to transport their troops to other planets. Though the Rebellion eventually lost the Battle of Hoth, they didn’t leave without taking down some of the walkers by means of tripping them. The harpoon and tow cables from the Snow Speeders proved handy and got the job done. This time, the Resistance may not be so lucky. It appears with the newly improved version of these walkers, the AT-M6 will be able to hold its own. With more canons, enhanced armor, and better mobility, these walkers are looking to prove more of a threat for the Resistance. I’m not quite sure if those Resistance speeders on Crait will stand a chance against these new walkers. If physical features are anything to go by, I’d say the First Order is more than prepared for this battle as the walkers appear to be fairly balanced this time around. Forget about trying to trip them, these walkers won’t be taken down that easily. This new family member of the Star Destroyers is named the First Order Dreadnaught. According to The Star Wars Show, it contains two enormous orbital auto cannons used to fire upon ships no matter the size. It’s a four class warship that measures almost 5 miles in length at 25,162.8 feet. Another interesting feature that this Star Destroyer has are many anti-aircraft canons on the outside of the ship. This should certainly help this ship keep away any pesky Resistance fighters that try and attack this ship directly. The First Order Dreadnaught is also a much sleeker ship than that of its predecessors possibly making it faster and more maneuverable. I have no doubt that the shields are also improved. The Resistance better be prepared for a fight against these behemoths. 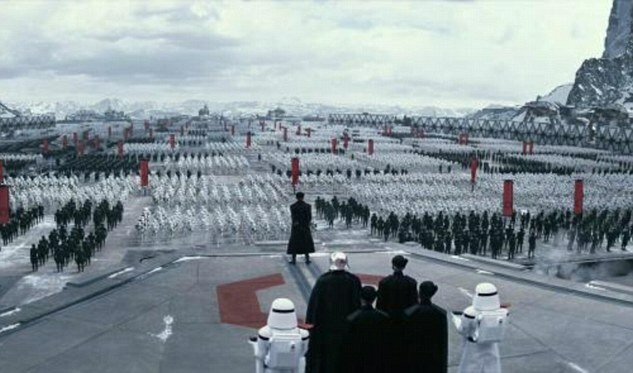 After the destruction of Starkiller Base, the First Order is going to come out in full force and will not hesitate to destroy anything that gets in their way. The Resistance has already taken a major hit with the decimation of Hosnian Prime. Their government is shattered with only a few troops and along with their captains to take on the First Order. The Resistance will have their hands full and will need every strategy to work in their favor. They’ll have to come up with a plan to take down these new weapons and vehicles the First Order has created. #TheLastJedi will hit theaters on December 15. What do you all think of the new additions to the First Order? Are you excited to see the new class of Star Destroyers and walkers? I’d love to hear what you all have to say in the comment section below!